• How do I request leaf and/or limb pickup? • What day is my trash picked up? • How do I use my trash cart for pickup? • How do I request furniture pickup? • What will the town pickup? • Does the Town offer recycling service? • How do I sign up for water service? • Who should I call after Town Hall hours for a water emergency? • How late is the Town office open? • Why are fire hydrants running? • How can I find additional community contact numbers? • What should I do if I have a pool and I need to fill or refill it but do not want to be charged the sewer fee? • What forms of payment does the Town accept? • What do I need to do if I'm starting a business in Wadesboro? • How do I rent a picnic shelter at Wadesboro City Park or City Pond? How much is it? • When is Wadesboro Park open? How do I request leaf and/or limb pickup? Call Town Hall at 704-694-5171 to request a pickup if you have put leaves or limbs at the street area. These must be in separate piles due to the danger of picking up items that may cause harm to employees or equipment. Please see Yard Rubbish pickup guidelines. Please see the trash pickup schedule (click on link for details). How do I use my trash cart for pickup? Please see the trash cart informational pamphlet (click on link for details). How do I request furniture pickup? Call Town Hall at 704-694-5171 to request a pickup if you have put the item at the street area. Employees are not allowed to go on your property to pick up items. You will need to list the items you want picked up so that no additional items may be incorrectly picked up at the same time. What will the town pickup? The Town has an Uptown recycling drop-off site. Please click here for more information. Does the Town offer recycling service? Leaves, limbs not cut down by a contractor (see Yard Rubbish Guidelines), furniture, tires if rims have been removed, dried paint cans or cans with sand added to paint. NO BUILDING SUPPLIES such as bricks, shingles or wood torn down during remodeling will be picked up. Go to Town Hall Monday through Friday from 8:30 am to 3:30 pm with your driver’s license or photo ID card, your social security card and a copy of lease if renting. Water service cannot be put under a person’s name without them being present. Complete the basic one page Water Service Application form and submit a $100.00 deposit. Deposit can be check, credit card or money order but it CANNOT BE CASH. This is THE only time you cannot pay in cash. If you don’t have a cut-off in your house, call Town Hall at 704-694-5171 to cut your water off for the whole house. Once you have the leak repaired, please call back and request the water to be turned back on. You can present a repair sheet stating what was repaired along with your name, address and phone number. You may receive one (1) adjustment per year if you meet qualifications such as your consumption was at least two (2) times your normal average. See Water/Sewer Adjustment Policy. A leak on your side (from the meter to your house) is your responsibility. A delay in repairing a leak can result in high water bills. Who should I call after Town Hall hours for a water emergency? Call the Wadesboro Police Department at 704-694-2167 extension # 1 and explain the problem to the dispatcher. How late is the Town office open? Town Hall is open Monday through Friday from 8:30 am to 5:00 pm unless there is a holiday. See list of holiday dates observed by the Town of Wadesboro. Why are fire hydrants running? Occasionally, we need to flush water through the lines after a repair was made nearby. This might result in water pressure being low. If you doubt that the hydrant being on is due to flushing, please call Town of Wadesboro at 704-694-5171 to confirm. If this is after hours, call the Wadesboro Police Dept. at 704-694-2167 extension # 1. How can I find additional community contact numbers? Call Town Hall (704-694-5171) to ask for a water meter read when you are starting to fill your pool and another when you finish filling your pool. Explain that you are requesting a sewer adjustment regarding the pool read. You may also give Town Hall the size of your pool (from the original box if applicable) and they can compute the number of gallons the pool will hold to keep on your account’s record. You will need to call every time you fill your pool to request this adjustment. If you are not a sewer customer with the Town of Wadesboro, we cannot issue an adjustment. Cash (except for initial water service deposit), check, money order, and charge/debit card from Discover, Master Card or Visa. We can accept charge/debit cards over the phone. We have a drive-through window available for your convenience next to the side of our building. We have a night dropbox with envelopes if you need to make a payment after office hours. Please make sure your name and address are included on the envelope. 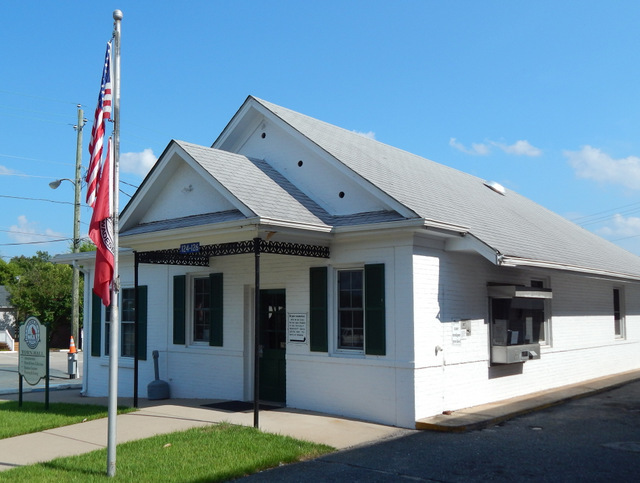 Wadesboro Town Hall is open Mon. - Fri.
What do I need to do if I'm starting a business in Wadesboro? #3) Marc Sessions (Fire Chief) for fire inspection (704-694-2167 ext. 1). The Anson County Chamber of Commerce may be able to provide additional helpful information. How do I rent a picnic shelter at Wadesboro City Park or City Pond? How much is it? You must come to Town Hall and fill out the application form. There is a $25.00 rental fee and a $25.00 deposit fee for a 4 hour usage. If you clean up the shelter area after your rental, the deposit is returned the following week when you bring in your photo ID and your receipt. The two $25.00 payments must be received in two different forms because the actual rental is deposited the day you make payment but the deposit is held until your event has passed. Make sure to know which park shelter you would like to rent: “Wadesboro City Pond” or “Wadesboro City Park” will be on your receipt along with the hours that you have reserved. Renting both shelters is a $250 fee plus a $50 deposit. Park rentals are not reserved over the phone. The City Pond rental area is a screen-enclosed shelter with 3 picnic tables available with an additional table off to the side of the enclosed area. There is a charcoal grill available on the outside near the screened-in location. City Pond also has a large fenced-in children’s playground available for use. There are additional charcoal grills and picnic tables available that you are able to use without any fees based on first come arrival. The Wadesboro City Park rental area is a covered shelter with 4 picnic tables available. This is not an enclosed area. There is a nearby charcoal grill available for your use if needed. Shelter # 1 has a sink available. Wadesboro City Park has a small children’s playground and a 7/8 of mile long walking trail. NOTE: Chalk or water balloons are not allowed at either location. When is City Pond open? Can we fish at City Pond? If so, what are the rates? Yes, you can fish at City Pond. Fishing at City Pond is subject to NC Wildlife Regulations. When is Wadesboro City Park open? If you arrive during this time frame and the gate is locked, please call the Wadesboro Police Department at 704-694-5171 extension # 1.